RED is simultaneously a sculpture and a sonic process. The work investigates interactions with unstable acoustic feedback systems. RED is simultaneously a sculpture and a sonic process. The work investigates interactions with unstable acoustic feedback systems. Often taking different presentation formats; the piece consists in building an acoustic feedback environment by setting up several wire nets and placing them in relation to the architectural features of the space. 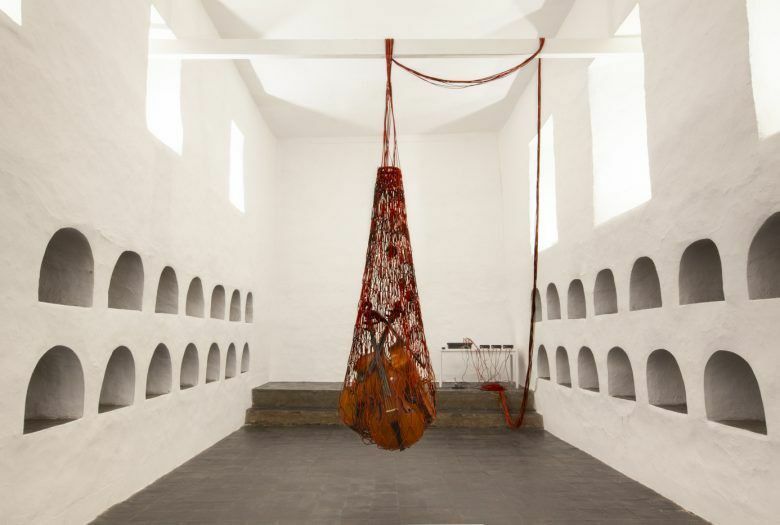 In this iteration of the piece, two large weaved wire-nets will hang from the ceiling holding instruments as a complex feedback organism. Drums and double basses will be both suspended and used as resonant feedback bodies, and simultaneously played in the space by Gerald Cleaver (drums) and Brandon Lopez (double bass). This kind of exploration with sonic feedback and resonant objects invites listeners and performers into the space, where they both affect and are affected by the sound phenomena. Sound is modulated by “presence” and occupies the space as acoustic architecture.